Excerpted from Davis Miller’s new book Approaching Ali: A Reclamation in Three Acts (W.W. Norton). Be sure to read Miller’s other famous story about his relationship with Ali right here. AUTHOR’S NOTE: This story was written as a nonfiction novel. My personal chronology in the story is less than accurate. All other details are true and factual. My name is Mouse. For years I’ve been smaller than everybody else my age. I’m 17 years old, 4-foot-9, and I weigh 60 pounds. My pediatrician, Dr. Glenn, says I’ll never get much larger. My size is the reason guys at school call me Mouse. That and the fact I have stand-up-high ears and a small nervous mouth that sits way back behind my too-big nose. The name my parents gave me isn’t Mouse. It’s Davis. But I almost never get called by my real name. When guys aren’t calling me Mouse or other meaner harder names that aren’t me, they’re doing other stuff to me. They punch me in the stomach, strip my trousers from my legs and push me into the girls’ restrooms, lock my skinny bones up in lockers. Or they drag me out to the courtyard and sit me up on high tree branches they know I’m not strong enough to climb down from. Sometimes they drape me across their shoulders and spin me around and around until my face gets covered with hives and I’m so dizzy I just about throw up. Then they put me on the ground and my hair is standing up on end while the rest of me is lying down. They always laugh when they do these things. I don’t want this stuff done to me, but I’m not big enough or fast enough or motivated enough to outrun anybody. What they don’t know is that I have a secret. A big, bad, walloping secret that protects me from everything they do and say. Inside of me, where they can’t see, I’m bigger than everyone who bullies me. Inside of me, I’m the biggest and strongest and fastest and greatest man in the world. Inside of me, I’m Muhammad Ali. Of course, I’m not really Muhammad Ali. He’s the king of boxing and the most famous man in the world. And I’m a shriveled little 17-year-old mouse at Mount Tabor High School in Winston-Salem, North Carolina. But for months and months I’ve been looking hard at my life and today I’ve made the decision I’m going to become just like Ali. Or at least as much like him as I can, considering the pissant me I’m forced to work with. I first saw Ali in January 1964. I was seven years old, the shortest, skinniest and sickliest kid in town. My mother had died that past August from a kidney disease that she and my dad and my sister and me and even our family doctor didn’t know she had. After my mom died, I shut myself off from the world. I quit eating and just about stopped talking, answering Daddy and everybody else mostly by grunting. That fall, he had to rush me to Baptist Hospital a couple of times, where doctors and nurses stuck long, fat needles in me and pumped me full of fluids and fed me through tubes because I wouldn’t eat or drink anything. When I wasn’t in the hospital, I spent almost every moment staring blankly at the TV. I didn’t feel like talking to anybody and didn’t even feel like getting up off of the sofa. Ali was anything but silent or just lying around. He was 21 years old, and although he was an adult who was free and on his own out in the world, he acted like a ridiculously noisy kid. I remember lying on the sofa staring at Daddy’s little black-and-white television while Ali was being interviewed. He was loud, impossibly confident and glowing as he trained for his fight against titleholder Sonny Liston for the biggest prize in sport, boxing’s heavyweight championship of the world. Liston was the most feared man in boxing. He’d knocked out everybody who’d faced him. Most boxing people thought that there was no one who could seriously threaten his reign. The only person who was taking Ali seriously was Ali himself. When I saw Ali that first time, his voice roared and crackled from the huge, live world outside and punched a hole through the TV’s three-inch, rattling speaker. “Liston’s too ugly to be champ,” the voice said. “The champ should be pretty like me. I’m young, I’m handsome, I’m fast, I’m pretty and can’t possibly be beat,” the voice announced. The song the voice sang pulsed with menace, with grace, with an odd innocence, and with astoundingly playful intensity. When I heard it, I felt the glory train pass through me. The next month, Ali surprised everybody by dominating then easily knocking out Liston. And for the next several years Ali handily whipped every person who stood in front of him in the ring. No one before had ever boxed the way Ali did. Even though I didn’t know anything about boxing, I knew I was witnessing something and someone brand new in the world—someone who was different from anyone who’d come before. Other fighters held their gloved fists up close to their ears and plodded back and forth like Rock ‘em, Sock ‘em Robots. Ali carried his hands open, palms-up and down at his sides and he danced quickly around the entire inside of the ring, which made him look beautifully in danger every moment he was boxing. The thing that kept him out of trouble was that he was the fastest (and most crazy-awake) man who’d ever fought. In his fight with Brian London, at the beginning of round three, in just two seconds—one hippopotamus, two hippopotamus—Ali launched and landed a mind-numbing series of 17 blows, punches thrown with such opponent-debilitating lightness, ease and speed that they looked almost transparent; they took on a transparency. London bowed, he fell, he lay, sprawled on the canvas. The reason it took London a full two seconds to fall is that Ali’s punches had come in such volume and with such velocity that they’d held London up. When Ali quit throwing, he stepped back and thrust his arms, godlike, above his head. Sitting in front of Daddy’s TV, I shook my head from side to side. How could anyone, much less a man as huge as Ali, a 6-foot-3 giant who weighed 210 pounds, how could he snap out more than eight concussively stiff punches in a single second? Not to mention that all the blows had struck a moving target. It didn’t seem possible. But I had seen Ali do it. Or at least I had seen the tracers his gloves left in passing. The one time it appeared that Ali would get beat wasn’t in the boxing ring but when he went up against the United States government. In 1967, Ali refused to be drafted into the army. He explained that he was a Nation of Islam minister and that his religion and his beliefs didn’t allow him to participate in the military. Millions of people in America didn’t like that, thought of him as a traitor and coward, and wanted him to go to jail. Millions of people in countries around the world admired the whomping-big courage it took to say no to the U.S. government, and Ali became their hero. Boxing authorities took away his world championship title and his license to box. The U.S. government took away his passport and wouldn’t let him leave the country to make a living. In federal court, he was convicted of draft evasion and sentenced to five years in prison. But in June 1971 the United States Supreme Court unanimously declared that Ali was a conscientious objector who’d been wrongfully convicted. Which cleared the way for him to do what he did this past week. In Zaire, Africa, on Tuesday night, Oct. 30, 1974, two and one-half months before his 33rd birthday, “old man” Ali battled the young, undefeated and seemingly invincible heavyweight king, George Foreman. Foreman’s childhood hero had been Sonny Liston. Before the fight, almost everybody believed that Foreman, the overall hardest puncher ever in the history of boxing, might actually kill the “ancient” and “fragile” Ali. That night I went to bed with my transistor radio tucked up under my pillow. After I’d switched off the lights, I pulled it out, tugged the stiff leather strap up around my wrist, placed the leather-covered speaker against my ear, and slowly rotated the tiny plastic dial back and forth until I found a gravel-voiced announcer who was summarizing each round of the fight after it had been fought. A little before midnight he said that, in round eight, after dominating almost every moment of the bout, Ali had knocked out the supposedly unbeatable Foreman. The only person I knew who wasn’t surprised, was me. Ali immediately became the most popular man on the planet. Many people who had hated him came to admire him. And now, because Ali has accomplished something as big and outlandish and worldly as all this, and because he’s done so much that almost no one thought he could do, I’ve decided I can maybe do something pretty good, too. “You want to do what?” Daddy says when I tell him my plans. “Dad?” he repeats. Like a lot of southerners, I always call my father “Daddy.” But I’ve been feeling pretty adult lately and sort of worldly too. So, at least in this moment, the word no longer fits. My father softly laughs. It’s Sunday afternoon and my sister Carol, Daddy and I are sitting around the dinner table after having stuffed ourselves on a big roasted turkey breast, steamed carrots and boiled potatoes. Over the years since my mom died, Daddy’s become a good cook. “Davis,” my father says, and I quit talking. Daddy almost always calls me “Dave.” When he uses my regular name that means he has something serious to say, and he wants me to listen. Carol picks up dirty dishes and carries them to the sink. As Daddy speaks, I remember stories my grandfather told me years ago—rich tales about Granddaddy’s seven brothers and sisters, of orphanages he had to live in after his mother died, about brawling his way out of the Methodist Children’s Home, about his years spent as a Merchant Marine. To me, tales of those times are as large as Aesop’s Fables. Maybe even bigger, because they’re about my own family. Stories of gold, of oranges and cinnamon, of storms, of shipwrecks, of ghosts. I remember Granddaddy’s other stories, too. Ones about his son’s baseball days and how Daddy’d been a talented player who’d been offered a full-ride scholarship to Appalachian State Teachers College. And how Daddy chose to marry my mother, instead. Deeper than memory, I know what it was like for Daddy after they married. I know about 200 newspapers Daddy delivered every morning before he went to work for 10 hours in a factory that made corrugated boxes for cigarettes. I remember that whenever Daddy got home and he hugged me, he was always wearing sand-colored khaki uniforms with black-and-white company patches my mother had sewn onto the breast pocket. And I remember Daddy going out a couple nights every week to try to sell newspaper subscriptions to new customers. And maybe this is one hokey thing to say, but on a Sunday afternoon in early November 1974, for the first time in my life, I came to understand Daddy in some way other than as the four walls, the ceiling and the floor around me: as the environment meant to protect me from the cold, tough, bone-splintering world outside. And as I speak, I feel memories loosen like last autumn’s leaves in a spring rain, sliding off the banks and into the muddy waters of the creek behind my father’s house. When I’ve worn myself out on about five of these, I run twice around Daddy’s backyard, my legs stiff from never having been used, tripping a couple times in mole holes and almost falling. I finish my day with a few overhead presses with the 22-pound, baby-blue plastic weight set Daddy’d tried to motivate me with when he bought it for me after my mother died. The next couple mornings I’m so sore I can barely lift my arms over my head. By then I’m pumping out push-ups in big bunches: four sets of 10, 20, then 35, now 50. Eventually, I get up to grinding out more than 500 a day. In January, I started with five sit-ups each workout. By April, I’m at 500 sit-ups, six days a week, every single week. Add a couple hundred crunches and leg raises on top of that. Forcing myself to eat four giant meals every day, and adding a gallon of milk and a couple blenders chock-full of ground-up ice cream, bananas and quick-weight-gain powder, I push the bathroom scales to 95 then 105, 112, 121. And I start growing in height. In May, when I go to Dr. Glenn’s office for my yearly physical, I measure in at a humongous 5-foot-5. Walking past the bathroom mirror in just a pair of gym shorts, out of the corner of my eye I spot crisply defined torso muscles: pectoralis, trapezius, latisimus dorsi, deltoids, rectis abdominus, everything. For part of a second, I wonder who this person is in the mirror. Then I smile... though I’m still not sure this is my image. I start taking karate lessons because there’s no boxing in town. I buy a uniform, go to class religiously and work as hard as I can—I kick at the walls, punch the air and other students countless hundreds of times, sweat and hurt for an hour and a half three nights every week. My favorite sparring partner is Eddie “Racecar” Ford, a fast, gangly, utterly awkward guy only a couple inches taller than me. Racecar has pretty good kicks and okay hands. But what makes him fun to spar is he’s my equivalent of who Ken Norton was to Ali: a puzzle I can’t easily solve. Racecar’s so awkward it’s almost impossible to predict the ways he’ll move, or what shots he’ll throw at you and when. Soon I apply for a job at the convenience store up the hill from Daddy’s house. The manager hires me to work second shift a couple nights a week, which allows me to support my Ali addiction—not only by giving me a few dollars—but also because, when I’m in the store by myself, I get to read all the boxing and martial-arts rags on the magazine rack. We sell a few paperbacks in the store, too, and I buy a copy of Norman Mailer’s The Fight. It’s the first real writing I’ve discovered about Ali and about the science of boxing; I had no idea something I was passionate about could be presented in such an accessible way—without destroying its power and mystery. Indeed, for me, Mailer enhances the beauty of pugilism by elegantly exploring it. Between customers, in addition to reading, I do push-ups, stretches, a little shadow; think up, work on and polish combinations until they gleam. It’s the first job I’ve had. I’m surprised how much I enjoy it. I recall getting in from work one night and spooning out a few vegetables Daddy’d left simmering for me on the stove, then carrying my plate into the den. While I stand with the plate in my right hand, forking stewed carrots and green beans into my mouth with the left, watching Johnny Carson while standing barefoot on the carpet, I throw three—count ‘em, THREE!—whippingly wonderful and beatifically beautiful round-kicks, all without touching my foot to the floor, cleanly snapping the heads from all three porcelain Cupid statuettes who are sitting there minding their own business on a bookshelf high up over to the left side of the TV. I’m not upset by this (after all, consider the control it took to perform this feat); rather, I’m amazed—“Hey, wow, cool,” I say—then, when I finish my final meal of the day and reach some level of post-martial sobriety, I try to repair my dead mom’s old figurines with Elmer’s wood glue. When I’m not working out, or pulling time at the convenience store, I’m studying Ali, on TV, in books or, most often, in free movies that roll behind my eyes. And I’m devouring all the convenience store Ali magazines, as well as every book about martial art and boxing that I can find. After studying The Fight time and again, an interest in real writing, in literary storytelling, starts to develop. I ask clerks in bookstores what fiction they enjoy most, and I find good nonfiction that way, too: by Harry Crews, Tom Wolfe, Gay Talese, Joan Didion, and later by Tim O’Brien, Norman Maclean and Maxine Hong Kingston, all of whom open me further and further to the possibilities of the world of storytelling. And as I continue to grow, the world keeps getting bigger. And then. I’m at 123, and 126, 128, 131, 135, and 140. What keeps me fascinated day in and day out is the belief that I’m doing something—shine on, shine on—and even more powerfully, I have the sense that in every moment there’s something extraordinary to learn, some lush place to go that is throbbingly, achingly remarkable. Traveling from gym to gym and learning from everyone who’ll spar with me, I like to outfinesse and outthink opponents, dropping my hands to my sides and dancing in circles just like Ali, but I don’t like hurting anyone or getting hurt. In fact, the idea of hurting another person makes me sick to my stomach. I buy a full-length mirror, place it against a wall in the basement and shadowbox every day in front of it. Like Ali, with every punch I throw, I blow the air from my lungs with a short, hot, fuuh sound. I dance and punch and kick and talk at the mirror, working to sound precisely like Ali. “No contest, no contest,” I shout, and “Is that all you got?” I ask the mirror. “Rumble, young man, rumble,” I proclaim as I get ready to start each round. “All night long,” I yell when up on my toes and dancing around the room. All these phrases are Ali’s own personal favorites. With hands, feet, head, and mouth, no matter how difficult the skill or maneuver, I focus on making everything seem effortless and look beautiful. Popping the air with blows too fast to count, I imagine lightning coursing through my limbs. I eventually get to where I can zing four, six, even eight crisp shots per second. And a funny thing happens because of all of this speedified “shoe shinin,” as Ali calls it. The heightened awareness that accompanies it expands my understanding of time; it teaches me how long that quick one second can be. All of which serves to open me further, and then further still, to the world, to its mysteries and possibilities. Within months, I begin to feel I might be close to ready for the next step in my big-time, big-world plans. After graduation ceremonies, the Mount Tabor guys all leave for Myrtle Beach and a week of beer drinking and passing out under the sun. At the suggestion of my karate friend Bobby, who’s Ali trainer Angelo Dundee’s nephew, I load my car with workout gear and spend a long day driving 500 miles from Winston-Salem to Ali’s training camp in Deer Lake, Pennsylvania, where he’s preparing for a world title defense against Joe Bugner, the British heavyweight titleholder. “I’ll see if I can get you in the ring with him,” Bobby’d said, teasing me. His voice is booming and musical. When he speaks, I feel it rumbling and rambling through my chest and belly. Listening to him makes me so nervous I shake a little and feel I need to pee. The old guy strapping a pair of rich-smelling red leather gloves on my arms looks at me and laughs. “He won’t hurt a little white boy like you,” he says. He finishes tying the gloves, wraps athletic tape twice around the laces to keep them in place, then leaves the cabin. I pace back and forth, staring at the small room. The rough, scaly bark of the logs that comprise the walls makes me think of crocodiles lining up to eat me alive. To escape the crocs I walk out the back door and step barefoot past boulders placed in a large circle around the cabin. On each rock a name has been painted by Ali’s dad, Cassius Marcellus Clay, Senior, in big red- and blue-trimmed white letters. I read the names—Willie “the Wisp” Pep and “Sugar” Ray Robinson, Jack Dempsey and Gene Tunney, Rocky Marciano and “Smoking” Joe Frazier, each man one of the best and most famous boxers ever. A rounded chunk of lichen-covered brown granite called Joe Louis has been granted the most honored position, in front of the main entrance to the gym. I listen to a train moaning a long way off. I watch the mailman come and go. “Good luck, son,” he says, chuckling. I walk back around the side of the cabin and climb the biggest boulder of all, a five-and-one-half-foot-high hunk of hard coal named after the very first black heavyweight champion, Jack Johnson. I stand on the rock, gloved hands at my sides. To calm myself and get my lungs started, I draw four deep slow breaths. With each inhalation, I swear I feel oxygen rush all the way down to my toes and out past my fingers. Closing my eyes, I imagine the very power of the cosmos flowing up from the boulder and into my body. I’m ready, I tell myself. I’m entirely ready for this moment. Opening my eyes as I continue to breathe and to relax, I’m pretty sure what I’ve just said to myself is true. He’s standing in the center of the ring when I climb the stairs and part the sky-blue, leather-encased ropes. Insect-looking splotches of dried blood dot the rough, porous, beige canvas. He’s in the process of wrapping his own hands, an act so uncommonly self-reliant for a boxer that it’s surely intimidated more than one sparring partner. I’m used to doing this myself, though, and so it doesn’t bother me. Plus I’ve carefully taped the balls of my feet so that I don’t need to worry about the canvas ripping or cutting them. As I stare up at him, he comes into focus and everything else blurs. His skin is unmarked and thoroughly without wrinkles, and he glows in a way that cannot be seen in photographs or on television. I realize once again that nobody else on the planet looks quite like him. Right square in the face, he’s nothing short of the world’s most beautiful and oversized kid. “This man’s a great karate master,” he says to the crowd, pointing a gloved left fist at me. His voice is young, innocent, in awe of itself. I’m no master of karate or of anything else, but it makes me feel good that he claims I am. Staring straight at me, he opens his mouth steamshovel-wide. Then, in a voice directed not just to the people in the room, but to the world at large, he shouts, “You must be a fool to get in the ring with me. When I’m through, you gowna think you been whupped by Bruce Lee.” The crowd laughs and, though I feel my face go red with embarrassment, I laugh with them. The bell rings and he dances to my right around the 20-foot square of taut canvas. Suddenly I’m no longer nervous. My legs are strong and full of spring, and there’s looseness in my movement. I feel so alive I wouldn’t be shocked if I instantaneously metamorphosed into nothing less than pure energy and light. I notice men, women and kids in the crowd. Almost every single person is smiling with anticipation. He bounces from side-to-side in front of me. I feel each step he takes tremble the ring, shoot into my feet and up my legs. I bend to the right, toss a jab toward his belt line, straighten, snap a long, tentative front-kick up to his head. I figure it’s the first kick he’s ever had thrown at him, but he pulls away as easily as if he’s been dodging feet his entire life. He stops dancing and stands flat-footed in front of me, studying my movements. Jesus, what a gigantic man. I try to zing in a left jab. My arm is too short to reach him. His eyes are snappingly bright, his face beaming and round and open. Sliding toward him, I launch a second jab. He waits until my punch is a half-inch from his nose and pulls his head straight back. I punch nothing but air and dreams. He drops his gloves to his sides and cranes his neck way out in my direction. Teasing by sticking out a long white-coated tongue, he steps back to the ropes, taking a seat on the second strand where his head is only a little higher than mine. With a brisk wave of gloves, he motions for me to come in after him. I block out spectators’ laughs and skip inside his arms three half-steps; he’s so close I feel his breath on my shoulder. I dig a roundkick into the soft area above his right hipbone and feel his flesh re-shape to that of my shin. Now I see the opening I was hoping to create. I fake a jab and rocket from my crouch, blasting a spinning backfist-jab-left hook combination straight into the center of his jaw. The punches feel so good I smile. People in the crowd Ooh and Aah. He opens his eyes fried-egg-wide in pretend disbelief. He has never thought of me before, will never think of me as a fighter again, but for the next two seconds I deserve his serious attention. For two long seconds we are inseparably bound, whirling in a galaxy of electricity, each seeing nothing but the other man. For two week-long seconds I am flying. Then he springs off of the ropes and squashes me with one flyswatter jab. I see the punch coming: a piece of gleaming red cinnamon candy exactly the size of a gloved fist. I try to slip to the side and can’t—it’s that fast. The back of my head bounces off of my shoulders. A chorus of white light goes off behind my eyes. A metal taste clouds my mouth, then comes a second heavier thump as he catches me with a left hook I don’t see. The spectators suddenly sound way, way off; my legs go to slow-turtle soup. He knows I’m hurt and he steps back. His eyes go soft and round and kind, he slides an arm around my shoulders, we exchange hugs and smiles, and it’s over. But I’ve accomplished something I’ve never, yet always, believed I’d have opportunity to do. 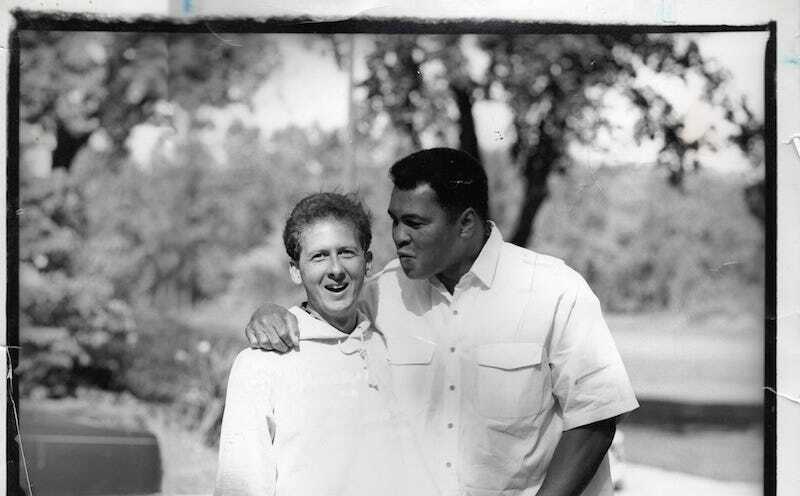 I have boxed with the world’s greatest athlete, Muhammad Ali. As we walk down the steps from the ring, my hero leans close to my ear and speaks in a way no man but my father has ever talked to me—softly, gently, almost purring. “You’re not as dumb as you look,” he says. It’s a line he must’ve used 500,000 times. No matter how often I’ve heard him say it on TV, every time it makes me laugh. He may as well have said he was adopting me. Davis Miller is the author of Approaching Ali: A Reclamation in Three Acts, and “My Dinner With Ali,” which was also republished on The Stacks. The Stacks is Deadspin’s living archive of great journalism, curated by Bronx Banter’s Alex Belth. Check out some of our favorites so far. Follow us on Twitter,@DeadspinStacks, or email us at thestacks@deadspin.com.